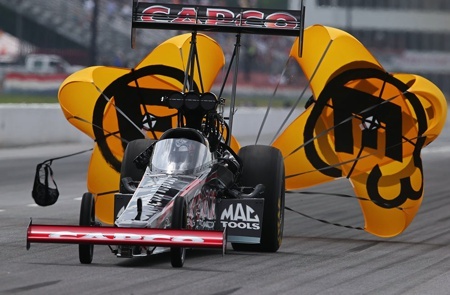 May 11, 2013 -- Steve Torrence and Lee Beard knew Spencer Massey was a tough opponent in Saturday’s Summit Racing Equipment NHRA Southern Nationals at Commerce, Ga., and he was. Torrence, who won his first Top Fuel race last year at Atlanta Dragway, did have his quickest elapsed time on his third 1,000-foot run with Beard tuning the Torrence Racing/Capco Contractors Inc. Top Fuel dragster, but it wasn’t enough to turn on the win light. He crossed the finish line in 3.884 seconds at 318.39 mph behind Massey’s 3.874 at 314.61. This was, nevertheless, an encouraging performance considering Beard only joined the team on Wednesday. He had very little time to prepare for Friday’s abbreviated two-lap qualifying session that was necessitated by last week’s heavy rain in the area. “While we didn’t get the win light in the first round,” said Torrence, “we did take another step in a positive direction. It’s going to take some time. Qualifying for the NHRA Kansas Nationals begins Friday at Heartland Park Topeka.